Each of these phases are discussed in turn below. 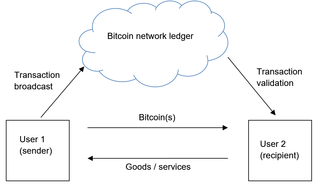 Each Bitcoin user has a digital wallet known as a “Bitcoin wallet” which incorporates a public/private key pair. As such, Bitcoin are “owned” and “held” by the user who has control of the relevant Bitcoin wallet. A Bitcoin wallet is also how Bitcoin are transferred between users. Specifically, Bitcoin are sent or received from one or more “Bitcoin addresses” associated with a Bitcoin wallet. A Bitcoin address is an alphanumeric string derived from the public key incorporated in a Bitcoin wallet. the “transaction” message is broadcast over the Bitcoin network and verified, and the Bitcoin transferred from the sender’s address to the recipient’s address. Only the first two steps involve action by the sender and recipient. The latter two steps are automatically executed by the Bitcoin software and the Bitcoin network. Importantly, Bitcoin are transferred directly from the sender to the recipient. Bitcoin “miners” validate and update the transaction in the public ledger, but are not payment intermediaries. It should be noted that the rate of creation of 12.5 new Bitcoin is current rate at the time of this paper, and it should be understood that the Bitcoin algorithm is designed to reduce that rate over time (halving approximately every 4 years). Bollen, Rhys, “The Legal Status of Online Currencies: Are Bitcoin the Future?” , (2013) 24 JBFLP 272 at 275.
 https://en.bitcoin.it/wiki/Introduction accessed 13 January 2014; http://www.forbes.com/sites/investopedia/2013/08/01/how-bitcoin-works/, Forbes(1 August 2013), (accessed 13 January 2014).